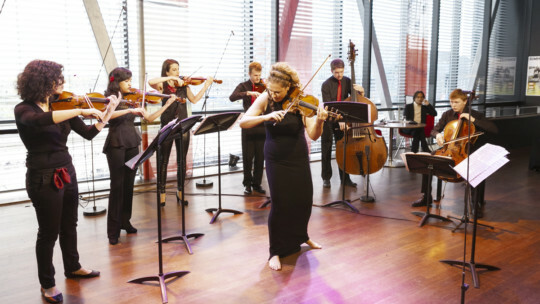 Aired on Dutch broadcaster VPRO's Vrije Geluiden on 1 and 7 May 2016, these performances can be watched via streaming. ORIGIN showcases pieces from the countries of Gwendolyn's roots while others are companions from her childhood – the songs she was raised listening to and playing, the music she is made of. The album bears witness to the unity of this contemporary master with some of the best and freshest contemporary talent - Gwendolyn’s students. The compositions and improvisations recorded here are the basis of the violinist’s bravura repertoire and encores, which she has passed on to her students over the years. Gwendolyn recognized the changing times on the international stages and programs she performs. This prompted her to record what she felt was quintessential repertoire, unwilling to witness such pieces become ghosts without a voice to express their beauty and the history they carry. On Vrije Geluiden, Gwendolyn performed pieces from ORIGIN.